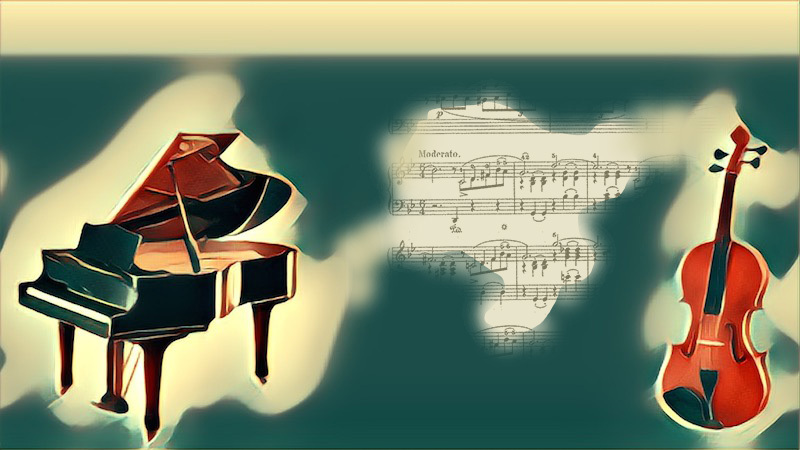 April 23, 2017, 3:57 AM · A recent post on Violinist.com announced the rediscovery and publication of Eugène Ysaÿe's violin transcription of Chopin's First Ballade. Not long after, a Twitter discussion ensued in which the relative merits of such transcriptions were called into question. I contributed a tweet or two to the thread, but felt there was more to say about the topic than what I could condense into 140 characters. Confession: I am an enthusiastic supporter -- and maker, and performer -- of transcriptions and arrangements. Speaking casually, I don't think there are any truly reasonable objections to playing and enjoying them. They can often shed new interpretive light on familiar works. (Think of Liszt's piano versions of Schubert and Schumann Lieder, all of which reinvent various structural aspects of the originals.) They can make familiar repertoire seem new, and even occasionally improve the balance or sound. (The various violin transcriptions that have been done from Bach's D-minor Harpsichord Concerto, BWV 1052, all seem like improvements to me. The same is true of an early 19th-century chamber arrangement of Beethoven's Fourth Piano Concerto. I hadn't realized just how bombastic the orchestral brass can sound, particularly when played on modern instruments, until I heard the sleeker, slenderer string quintet arrangement.) More importantly, they make great repertoire available to anyone who wants to consume it. When a violinist has played Bach's Sonatas and Partitas, why should his flute or keyboard works not be the next frontier? Some excellent music has been written for the violin -- indeed, our repertoire is second in greatness only to keyboardists' -- but there's always room for more. If some pianists have been known to borrow the Beethoven Violin Concerto, should we feel bad about appropriating a Chopin Ballade? Not at all! By the end of the 18th century, interests in transcription were more practical. Recordings and mass-production of miniature scores had yet to be invented, but a public full of concert- and operagoing music lovers wanted to listen to their favorite tunes in the comfort of their homes. The solution? Publish chamber or solo arrangements of nearly everything, from symphonies to ballets to operas. (Consider Salomon's arrangements of Haydn Symphonies for string quartet, flute and piano, or various four-hand piano arrangements of Mozart's operas.) Some works were even conceived to be instrumentally flexible. Mozart's Piano Concertos 11, 12, and 13 were written with orchestral wind parts that could be dispensed with to make the works playable at home by a piano and string quartet. These examples all involve scaling large works down to chamber-size, but things went the other way, too: an anonymous arrangement from Beethoven's lifetime gives the Kreutzer Sonata in a version for string quintet! Incidentally, Beethoven himself might have done a fair amount of arranging. Baerenreiter has published an anonymous historical edition of Mozart's clarinet concerto for viola, and I always suspected that Beethoven had something to do with this. Who else 1) was obsessed with Mozart, 2) had access to Mozart's scores through his association with Constanze, WAM's widow, 3) was interested in the viola, and 4) had a strong interest in publishing arrangements anonymously so as to maintain the purity of his compositional brand (so to speak)? I suppose, however, that the historical justification for arrangements misses some of the relevant points. After all, what they did then needn't have any bearing on what we do now. Sure, in the days before iTunes, people needed arrangements. But we can listen to any performance we like of Chopin's G-minor Ballade; do we really need to "deface" the music by rewriting it for violin? There is a covert (and unhelpful) mind-body dichotomy lurking behind the way we often think of transcriptions. Many of us think of "the music" (= mind) as one entity, existing in some pure, perfect, abstract, instrumentation-free conception, and "the instrument" it was written for (= body) as a choice the composer made after the fact. To put it more concretely, one might think: "Chopin thought of some tunes, and then he decided to write them for the piano." "Bach had a fugue subject in mind, and he wrote it for the unaccompanied violin, but could have written it for an organ or orchestra if he had wanted to." If this were true, then transcription would be at once unproblematic, but also pointless. Unproblematic because the composer "might as well" have written the piece out for any instrument, so why not just take that next step and do it ourselves? Pointless because: one instrument is as good as any other. Why bother transcribing? Just get the original score, read the melody on whatever instrument you play, and call it a day. Of course, the problem is that musical composition is not an abstract mental activity. Melodies cannot just be separated from their instruments. (More precisely: some really simple melodies can, but the sorts we find in great music generally can't.) Transcription is a creative act precisely because music that is deeply bound up in the idiom of its original instrument will have to be recomposed, or at least reconceived, when it is written for another instrument. The reason we have (for example) multiple conjectured violin reconstructions of Bach's Toccata and Fugue is precisely because no two arrangers can decide on exactly what the right violin "translation" is of some of Bach's organ writing. This is precisely what makes the best transcriptions, including Ysaÿe's Chopin and Liszt's Schumann, so interesting. Both completely reimagine the original. They imply: "if we were playing the original on the original instrument, even our most creative interpretations would be limited. So let's rewrite it." In Liszt's Schumann, it's fascinating to see where he interjects flights of arpeggiation, where he revoices the vocal line, how he uses piano technique itself to build a further layer of plot and drama into the songs. The same is true of Ysaÿe's Chopin (from what I can hear of it): where he uses violin polyphony, where he inverts the violin-piano relationship, all actively interpret the piece far more than a solo pianist could do. The mind-body dichotomy is as false for the initial act of composition as it is for arrangements. When Bach writes a fugue subject for the violin, he writes a different kind of subject than he does for keyboard. Why? Because he knows that this subject, along with two or three other voices, will need to be playable on a four-stringed instrument tuned in fifths. This is true for all 18 polyphonic movements in his Sonatas and Partitas. They could not have been written, or even conceived, except with the violin explicitly in mind. The violin's tuning guides every melody, every voicing, and even every modulation (and, by extension, all other structural considerations) in the cycle. In a very real sense, Bach's music is thus a logical result of the violin, and if it can be arranged for another instrument, that is an extra benefit. (It is tempting to draw a comparison with Michelangelo, who, when looking at a block of marble, saw the finished statue locked within the stone.) The same can be said of Chopin's piano works, from the shapes of his accompaniments to the contours of his melodies, and probably of all other virtuoso music as well. When music so perfectly suited to one instrument is arranged for another, a kind of recomposition -- not just rearrangement -- must necessarily take place. The best transcriptions are thus provocative, challenging, imaginative, and creative. When done well, they offer a new window onto familiar works, and this is always an intrinsic good. Art: What Makes It Great? Discussion: Transcriptions of the major cello concertos on viola! April 24, 2017 at 05:17 AM · Beautifully said. I can't wait to hear it. April 24, 2017 at 03:14 PM · My thoughts exactly. I might also add that, while Ysaye himself tried to minimize his role as transcriber (he credits himself on the cover to the manuscript for the Chopin Ballade transcription "interpreted and fingered for the violin by"), I viewed his contribution as much more of a recomposition of the original work. While the basic structure is unchanged, many passages have been altered or significantly rewritten to be more intuitive on the violin. Additionally, Ysaye gives a few indications in the piano score that he planned on eventually expanding the work for violin and orchestra. Certainly more thought went into it's creation than just 'giving the violin the melody', and I believe it has plenty of artistic merit and worth on its own. April 24, 2017 at 06:23 PM · This was a very important and thoughtfully consideration. In beginning method books for various instruments we find a universal willingness to dumb down the compositions of the Masters to allow for the limited technique of the beginner. Why not allow arrangements to go the the opposite direction where an original melody or composition is expanded to include the special qualities of a different instrument than was originally intended? And so has it been done as witnessed by the Waxman fantasy for violin and orchestra from Bizet's Carmen, or Heifetz's transcriptions of Gershwin preludes. Wagner wanted to correct certain "mistakes" in Mozart. I too have been alarmed by certain transcriptions of the violin literature for other instruments because they appear to me to be such compromises, but I can well envision that certain horn concertos might be improved to my ear by their transfer to the violin. And examine the famous Stokowski version of Bach's tocata and fugue. Magnificent and it might have been originally written for violin solo. So I say the more transfers, the more creative arragements the better. Each has to be independently examined for it's merit. Darren Briggs, violinist and teacher in the Los Angeles area. April 24, 2017 at 08:16 PM · It's not just classical music lovers that get their underwear in a knot when people toy around with "original versions," for example, a number of years ago, I presented my teenage children with this interesting reimagination of the pop song Radioactive that I had come across. They were pretty dismayed to find the edge all rubbed off, even though I thought it was kind of interesting with strings and vocals. "Muzak," by their standards! Then I thought of elevator music, not my favorite thing...And yet, I do think that the whole process of transcription and "remaking" music is a way of embracing, reinventing, and allowing a culture to grow. Not every transcription (or remake) is genius, but some are - some are even better than the original.